My grandfather Mike didn’t talk much about how he got to the United States, though I always knew it had been a tortuous trajectory that required him to become fluent in something like six different languages. My father joked that he spoke all of them with the same indecipherable accent, which was probably true. As far as we know, Mike (or Meilech in Yiddish, or Manyek in Polish) was eighteen and living in Krakow in the late 1930s. Shortly before the Nazi invasion of Poland, he fled with some of his family, making his way to Antwerp, then Brussels, then Paris, Nice, Lisbon, Havana, Miami, and finally New York. There is some possibility that he had managed to get himself a student visa to go to the Free University of Brussels (quite a name for a Jew fleeing from dictatorship), but he never attended. Instead, in Antwerp, he learned diamond cutting (or “cleaving”) from his older brother, and this became his trade. No one is sure how he and his brother, cousin, and aunt made their way to Paris, but the story goes that when the Nazis crossed the border into the Netherlands and Belgium, the family took a car and headed south through France. At one point, they ran out of gas and sent Mike to get some, and when he returned, they were gone. Supposedly they had been given gas by a passersby and, worried about waiting too long by the side of the road, had gone on by themselves. Mike got his hands on a bicycle and proceeded on his own, leaving a message with a friend in Paris who served as a contact in case the family got separated. He managed to catch up with them in Nice, where they stayed until Vichy France was absorbed by the Nazi government in 1942. At that point, the Vichy French officials had been told to stop issuing exit visas, but Mike managed get visas for himself and his family by, in his non-native French, convincing one official that visas were still being issued in other locations. This is how my grandfather apparently told it but it always sounded as though, in his accounts, credulousness and generosity, on the part of the objects of his guile, might have gotten confused. They left Lisbon on one of the last refugee ships. He spent the bulk of the war in Havana, and after it was over, his immigration was sponsored by a cousin who was already in the US. Since he was coming from Cuba, he arrived by boat in Miami, and, with the transportation shortage in the immediate postwar years, the only way he could get to New York was by getting his hands on a forged train ticket. Once he boarded the train, though, an American soldier with a legitimate ticket for the seat appeared. The soldier eventually gave up the seat and allowed Mike to occupy it for the whole trip, though again, it was unclear whether Mike had, as he presented it, smooth talked his way into the seat, or whether he had been the object of the soldier’s unbidden kindness. In New York, he continued his craft as a diamond cleaver, met my grandmother (who had also immigrated from Poland with her family, but in the nineteen twenties), and had my father and aunt, who grew up on the beaches of Long Island. I remember Mike as a taciturn man who sat slumped in his chair, legs crossed. He would kick the top leg back and forth in what I assumed was a tic but later learned was a side effect of psychiatric medication. He didn’t speak much and when he did I had trouble understanding. Apparently, he didn’t tell my father and aunt terribly much of his experience during the war; they pieced the narrative together from his brief remarks and the accounts of relatives and friends. He would talk more about diamond cleaving: its ins and outs, its stresses. It was a high pressure business. The diamonds were very valuable and had to be cut very precisely—any mistake was disastrous. 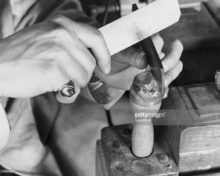 Once, he said, he was in the cutting room, with a gem on the cutter, and it rolled onto the floor and disappeared into a crevice. He couldn’t find it for ten minutes, and, he said, it was the most frightening ten minutes of his life. That he could have insisted this was so may indicate the extent to which what is unspoken always reappears, in displaced form. In this story, who, really, is the precious object that was almost lost? My father was called “Mister Vocabulary” in junior high, and my aunt went on to become a linguist. I learned French and Russian. I see this passion for language as a way of transfiguring the medium that got Mike out of Europe but that he eventually refused. Perhaps we are all trying to recuperate his act of shutting up. My practice, now, as a psychoanalyst pays homage to the idea that language can, not so much heal cleavages, but rather account for what they produce. It is very important to keep speaking. This is also why it is so important to tell, and listen to, immigrant stories.